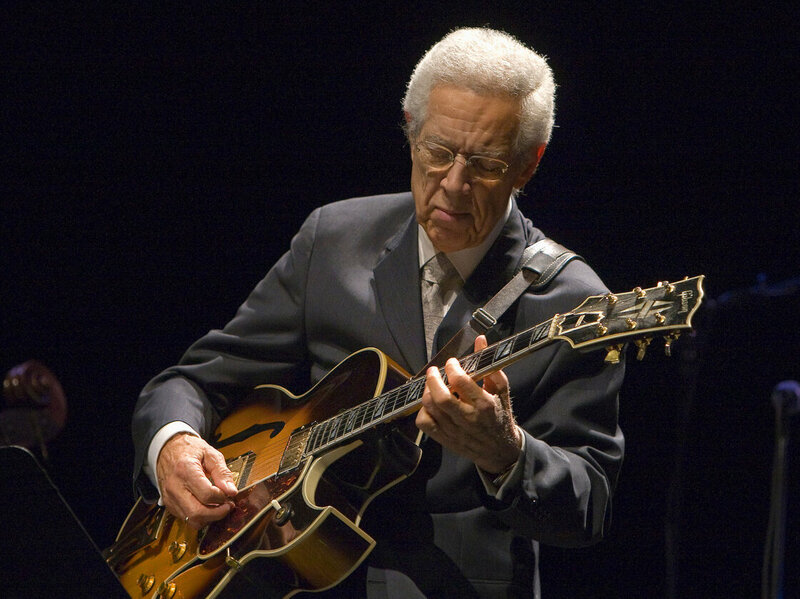 Kenny Burrell performs at his 80th birthday concert in 2011. Just before 11 o’clock on a crisp Monday night in Hollywood, 82-year-old Kenny Burrell put his Gibson guitar in its velvet-lined case and said goodnight to several members of the Los Angeles Jazz Orchestra Unlimited. He had just finished an intermission-free, two-hour-plus set with the large ensemble, as he has done once a month since the summer. Waiting patiently among the suits and smiles was a 21-year-old guitarist eager to meet his idol. When the room finally cleared, Burrell was amiable and inquisitive, talking to the young fan about music and Michigan, where he grew up. Fifteen years ago, I was one of those kids waiting outside the green room. I later became one of his students at UCLA, where he told firsthand accounts of interacting with Thelonious Monk and Dizzy Gillespie while also driving small ensembles with a steely strum. Burrell is a rare musician for his generation. While in his early 20s, he acquired a bachelor’s degree in music theory and composition. While waiting for that teaching opportunity, he made himself an essential character in the history textbooks. Burrell made his recording debut in 1951 with Dizzy Gillespie, and has since recorded more than 100 albums under his own name. He also lends his soulful tone to a handful of career-defining Jimmy Smith records, as well as notable LPs by Paul Chambers and Coleman Hawkins. His energy and tone today sound just as assured and unmistakable as they did when he started. Burrell first became involved in jazz education in 1978, when he taught a 10-week overview of Duke Ellington for UCLA’s Center for African American Studies. When he was first offered the position, Burrell says he wasn’t quite sure how to approach a subject as broad as jazz. 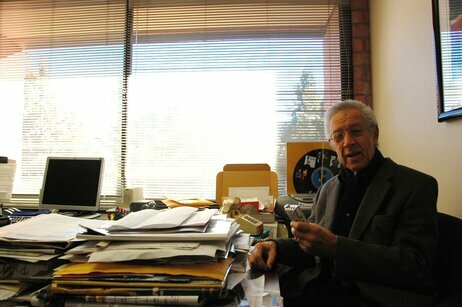 Kenny Burrell in his UCLA office. In 1996, his success with the Ellingtonia course and an expanding academic interest in the art form encouraged UCLA to offer a jazz studies degree. Burrell was the logical choice to head the program; he enlisted fellow storied musicians like bandleader Gerald Wilson, saxophonist Harold Land and drummer Billy Higgins to help teach ensembles and history classes. “Kenny started the jazz studies program while I was there, so there were a lot of exciting things happening at that time,” trombonist and former student Alan Ferber says. “He always had such a joyful spirit and an elegance with the way he carried himself around campus. Nearly 20 years later, the program has expanded considerably, thanks to the music-industry heavyweights who live in the surrounding hills. Trumpeter Herb Alpert donated $30 million to UCLA’s varied music programs, music executive Mo Ostin donated $10 million to help build a much-needed expansion of the music building, and the Thelonious Monk Institute of Jazz moved in last year, bringing musicians like Herbie Hancock and Wayne Shorter to the linoleum hallways. Of the more than 28,000 undergraduate students at the school, only 35 are jazz majors. But the list of alumni includes not only Ferber, but also saxophonist Kamasi Washington, trombonist Isaac Smith and vocalist Gretchen Parlato. Clearly, not every graduate can be a headliner, and Burrell says he owes all of his students more than just a handshake and a diploma. That led to the Los Angeles Jazz Orchestra Unlimited, Burrell’s unofficial post-graduate opportunity for his students as well as the broader Los Angeles jazz scene. It’s a swinging large ensemble dedicated to classic jazz repertoire and the writing and arranging of band members. The Los Angeles Jazz Orchestra Unlimited is not a part of the UCLA jazz studies curriculum, but it does include UCLA staff (trumpeter Bobby Rodriguez, saxophonists Charles Owens and Justo Almario) and graduates (saxophonist Hitomi Oba, trombonist Nick DiPinna) who get plenty of opportunities to solo and earn a regular paycheck. Burrell says he hopes to expand his concept of resident jazz orchestras to cities across the U.S., hopefully underwritten by cultural organizations and corporations in much the same way symphony orchestras survive. The potential is rich, but it hasn’t proven particularly easy to enact. Nonetheless, at a time when most people are enjoying retirement, Burrell lends his celebrity, his time and his guitar to make his dream happen.